a collaborative text assembled by Neil Cummings, Marsha Bradfield and David Cross for a Cultures of Resilience publication. The text outlines research into communities of evaluation that culminated in #TransActing. The publication is available as a .pdf from the foot of the page. 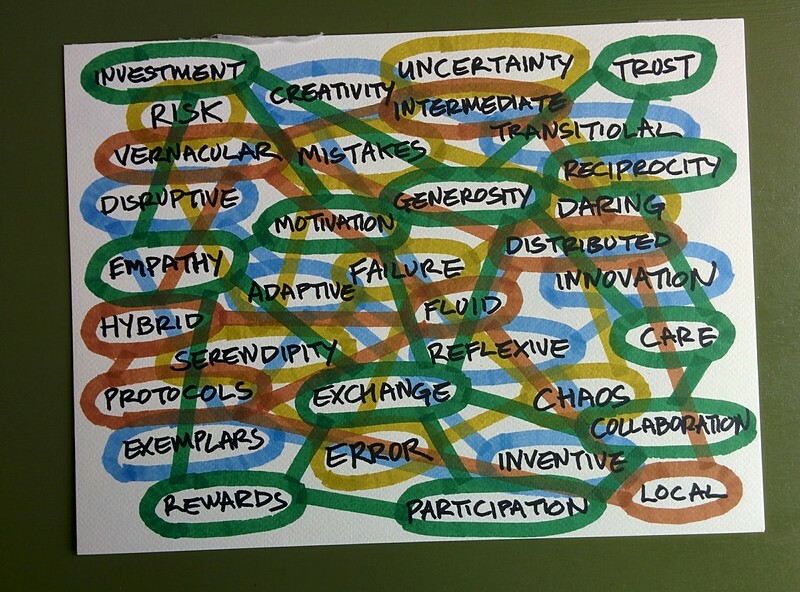 Coordinated by Ezio Manzini and Nick Bell, Culture of Resilience (CoR) was a cultural experiment that could be encapsulated by the following: take the community of academics of a large and prestigious university of art and design. Launch a discussion on a socially relevant topic, in this case resilience and register its results, in terms of ideas, projects and mutual exchange. What emerged were ‘multiple visions’ of resilience, a complex set of narratives, values, ideas and projects that critically reflect on the socio-technical systems in which they are embedded. During the two years of the CoR project Ezio observed that, consciously or not, art and design brings people together in special ways, instigating social assemblies that foster new social connections and collaborations. Ezio therefore, encouraged all contributors to Weaving People and Places to give a short account of a specific Moment of Encounter. These are the very special moments in which new collaborative encounters were produced, moments in which two or more persons meet and do something together in a given place. 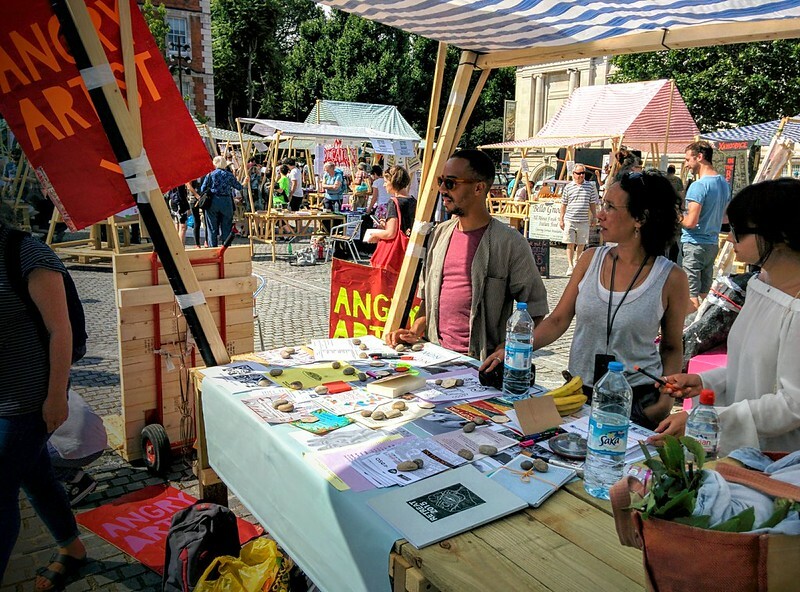 This bustling pop-up market featured artists, designers, donorpreneurs, publishers, civil-society groups, academics, ecologists, activists and others who creatively explore existing structures of evaluation and actively produce new ones. A market connects peoples’ needs and desires, through things, sometimes material things, via mediums of exchange, transactions. 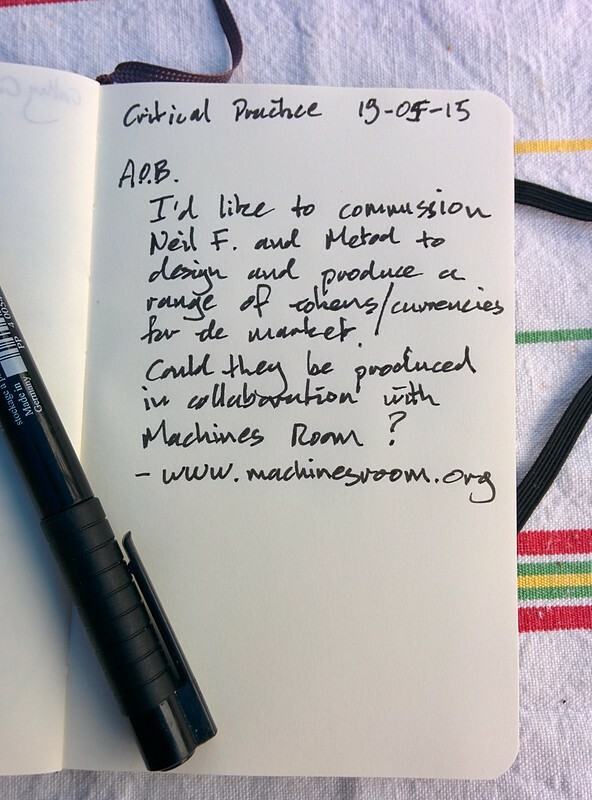 Markets are a bundle of simple technologies interlocked to form an ecology. I collaborated with Neil Farnan and Metod Blejec to produce a currency for #TransActing. About a year ago, we started discussing the possibility of developing a Local Currency (LC) for #TransActing; a Market of Values. We thought it would be good to have a medium which could be used to exchange knowledge, goods and services, and at the same time a technology to heighten awareness to what was being transacted, i.e., attention, time, care, and by whom. These are things that, traditionally, money tends to erase. We wanted the currency to be one of the places where the various values transacted at the market, would leave a trace. This bustling pop-up market will feature artists, designers, economists, donorpreneurs, civil-society groups, academics, ecologists, activists and others who creatively explore existing structures of evaluation and actively produce new ones. In thinking about how to construct the 'market stalls', the physical infrastructure for #TransActing, we decide to try and embody our interest in resilient evaluative practices. Our intention was to recycle materials from the terminated degree show exhibitions at Chelsea College of Arts - every year, there is a suite of skips used to dump unwanted artworks, trashed exhibition making materials, unloved things - to produce the markets stalls. With this in mind we have been working with Public Works to explore possibilities, and at a previous meeting Andreas (of Public Works) introduced the autoprogettazione furniture series of Enzo Mari from 1974. 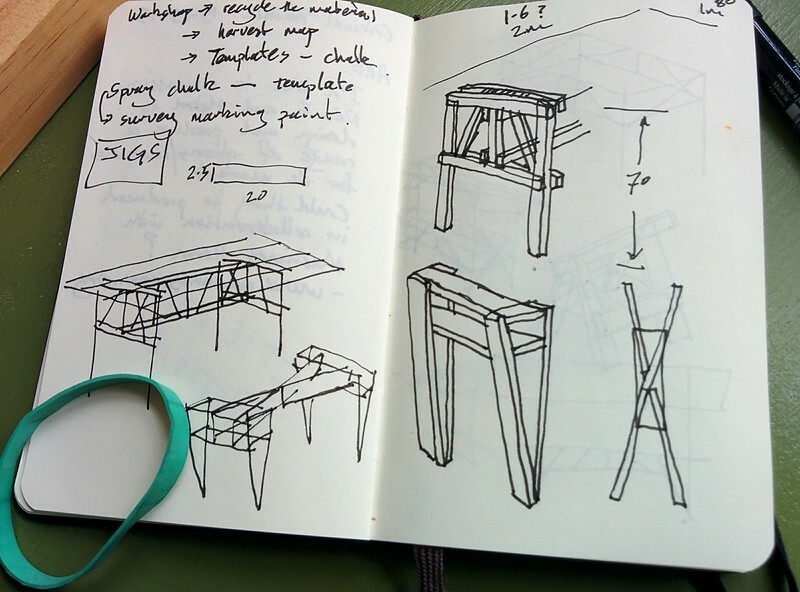 The series utilised standard timber section to produce a range of tables, chairs, beds and bookshelves, using simple tools - a saw, ruler, square, hammer and nails, and requiring only basic DIY skills. The plans, with dimensions and cutting log for the furniture were also freely published by Mari in a premonition of a Free Libre Open Source Software (FLOSS) ethic, and a gesture towards a cultural and material commons. We decide to use Mari as our guide, and develop potential stalls.